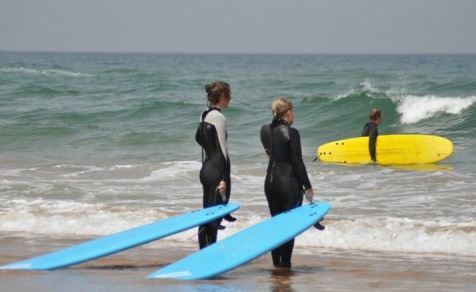 Agadir Holidays the city is in southwest Morocco located on the shore of the Atlantic Ocean It is an important fishing and surfing area It is also a famous seaside resort with a long sandy beach Algeria borders Morocco to the east and southeast. Accommodation Latest Agadir booking: yesterday. City Maps Agadir Morocco is an easy to use small pocket book filled with all you need for your stay in the big city. Attractions, pubs, bars, restaurants, museums, convenience stores, clothing stores, shopping centers, marketplaces, police, emergency facilities and the list goes on and on. This collection of maps is up to date with the latest developments of the city. This Agidar city map is a must if you wish to enjoy the city without internet connection. Agadir is a city in southwest Morocco. The city is located on the shore of the Atlantic Ocean. Agadir is an important fishing and commercial port. It is also a famous seaside resort with a long sandy beach. Algeria borders Morocco to the east and southeast though the border between the two countries has been closed since 1994. There are also four Spanish enclaves on the Mediterranean coast: Ceuta, Melilla, PeÃ±Ã³n de VÃ©lez de la Gomera, PeÃ±Ã³n de Alhucemas, and the Chafarinas islands, as well as the disputed islet Perejil. Off the Atlantic coast the Canary Islands belong to Spain, whereas Madeira to the north is Portuguese. To the north, Morocco is bordered by and controls part of the Strait of Gibraltar, giving it power over the waterways in and out of the Mediterranean sea. The Rif mountains occupy the region bordering the Mediterranean from the north-west to the north-east. The Atlas Mountains run down the backbone of the country, from the south west to the north east. Most of the south east portion of the country is in the Sahara Desert and as such is generally sparsely populated and unproductive economically. Most of the population lives to the north of these mountains, while to the south is the desert. To the south, lies the Western Sahara, a former Spanish colony that was annexed by Morocco in 1975 (see Green March). Morocco claims that the Western Sahara is part of its territory and refers to that as its Southern Provinces. After the earthquake, just four years post independence there was a strong desire to rebuild Agadir as a modern city that showed the country with its feet firmly entrenched in both the east and the west. As it was the start of the 1960âs, utilitarianism was the trend and the general theme of much of the city centre is low, white, featureless building made out of cement and lacking in any of the ornate character, which gives Morocco its alluring appeal. Somehow, however, the city seems to get away with it. Its wide streets, 300 day a year of sun, 10 km of sandy beach, non-pretentious crowds and holiday atmosphere make up for the dull architecture. Admittedly, few go to Agadir to get a real taste of Morocco, it is a tourist resort full of large all-inclusive hotels, casinos, nightclubs, ice cream parlours, volley ball, bronzed bodies, gay men, the dreaded karaoke and an increasingly large number of Brits, scorned by Maroc-ophlies as being an unfortunate extension of Spanish Costa. Charter airline and package tour companies tout it as a winter sun destination offering some of the cheapest flights to Morocco. Very recently, there has been a surge of British people buying retirement homes in Agadir to use either year round or as winter getaway homes. The only historical relic of note is the Kasbah sitting on top a hill 750 feet above the city, looking out over the Atlantic. It was built a defence against attacks from the Portuguese. Following the earthquake, only a section of the original ramparts and the main gateway remain in Agadir. Also Bed Breakfast Bed and BreakfastÂ B&B BB or BnB details for your next vacation local information guide. B and B is an English traditional holiday idea, often hard to find in some parts of the world. Take A Break Holidays takeabreakholidays, Agadir San Francisco De Asis, Urb Marina, San Fulgencio, 03177, Alicante, Spain.